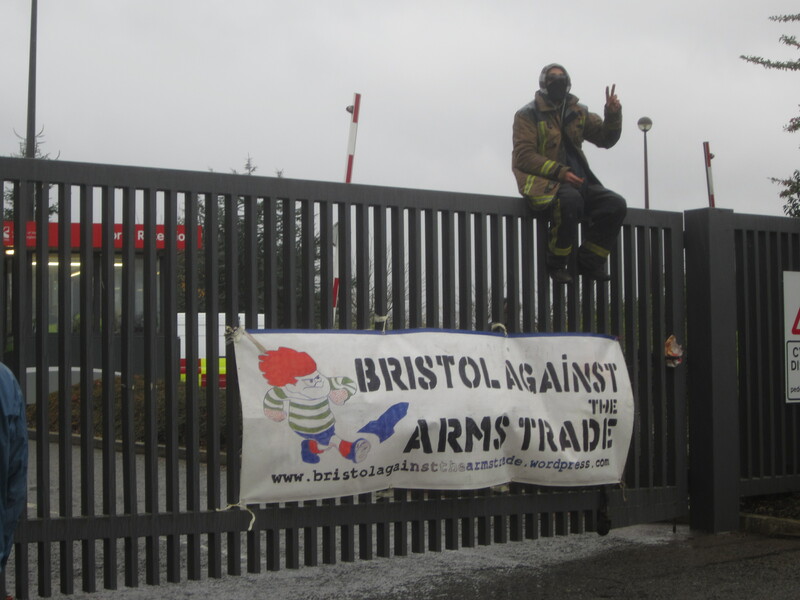 Companies attending today’s ‘Defence, Procurement, Research, Technology and Exportation’ Event were greeted this morning by queues trailing back along the A4174 as protesters blocked the UWE North Entrance. One gate was eventually locked and attendees forced to use other entrances. Later as they approached the building attendees were accompanied to the door of UWE’s Exhibition and Conference Centre by protesters just letting them know who would be attending the event; the likes of Raytheon (cluster bombs in Iraq, missiles in Gaza), Babcock (nuclear submarines), Chemring (teargas used in the Arab Spring) and our good friends BAE Systems. Crowds of protesters gathered at the entrance to ensure that UWE were suitably embarrassed to be holding the event and that those entering were told they weren’t welcome on the campus or in our city. Some UWE students peacefully enter arms conference and staged a die-in. They were threatened with arrest for trespassing on their own university. The protest continued around campus letting students know what was being held at their space and banners held at each entrance. Arms dealers and the likes of these companies will be greeted by the same response at future events at UWE.